I have decided I will no longer confront people who park illegally in spaces designated for the disabled. I have been abused once too often. Yesterday, a perfectly able-bodied woman of about 40 got out of the large 4WD she blithely parked in the disabled spot at the IGA carpark here in Mooloolah and noticed me standing nearby with an incredulous look on my face. Cleverly putting 2 and 2 together, she guessed correctly that I was unimpressed with her choice of parking spaces; especially when there were plenty others available. “I have a disability,” she brazenly told me, in a belligerent tone – the belligerence born, I’m sure, of guilt and bloody-mindedness. Ha! As if I look like a cop, and as if it makes any difference who I am. “No,” I said, “but I could take down your number plate and give it to the cops.” If she wanted to bring the law into it, so be it. She went huffily into the store and I stood deciding what to do. She came back out. “I’m not judging your life, only your decision to park here. And it doesn’t make any difference how long you’re going to be here,” I interrupted, getting madder by the minute. Conversation over. She stormed into the shops and I followed, keeping my distance. I was a bit shaken, because I’m not very good at confrontation. I’ve had much worse than that before, including with Christopher sitting next to me in his wheelchair. I have been shouted at and once I was cursed with language I don’t want him to hear. I’m not sure whether he wants his old man to be Arnold Schwarzenegger or Gandhi at such times, but I am neither. Didn’t see her again and she was gone by the time I came out. I’m not going to say anything to anyone anymore. It is not worth it. I have no energy reserves to draw on to deal with cretins who are too lazy and selfish to do the right thing; and who are too well aware that they are fudging to be reasonable when someones confronts them with it. Perhaps a mum with a disabled child would get less lip when confronting people about this. Maybe it’s because I’m a bloke. A bloke who doesn’t look very intimidating. ~ by Garry on January 8, 2013. Disgusting. 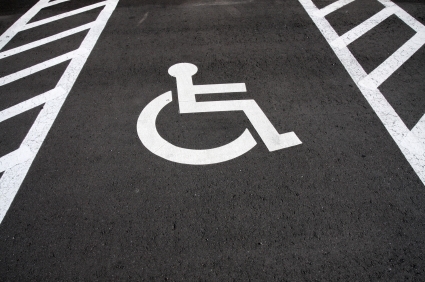 Print out some leaflets – ‘If you want my park, do you want my disability too’. Being a coward, I would put them on when the ‘enemy’ is not watching. Probably won’t make any difference to ignorant people, but it may make you feel better and may be less stressful. That’s so disappointing 😦 Can you report people who do this? Good suggestion about the leaflet. The other one is ‘laziness is not a disability…your registration number has been photographed and sent to the police and you may be receiving a fine.” Not going to bother though. I have less confidence than I used to in public and it never was that great to begin with. Julie, reporting requires witnesses and evidence, but, yes, technically, it is a parking offence and is punishable. I don’t know that it is worth it. As I say, my energy reserves are usually limited and confrontations require energy. Just going to stop bothering. If people park there, I can only assume it is bloody-mindedness anyway, so what’s the point? And, btw, Tamara reminded me that she too was abused years ago in Toowoomba when she confronted a family brazenly giving the finger to the rest of the civilized world. She has never said anything since then either. For me, it is not a really big deal; except for the unspoken attitude behind it. That tends to hurt.